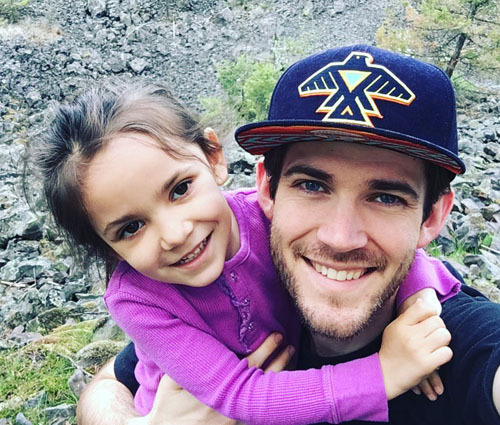 K-2 Salish Immersion Lead Teacher Grahm Wiley-Camacho and his daughter X̌sčnitkʷ, who is also a first-grade student in his class. According to linguists, languages not learned by children in the traditional way, passed on from one generation to the next, are doomed to extinction. Unless, of course, there are conscious and deliberate efforts taken by the community and their philanthropic partners to revitalize those languages. In 2009, LaRae Wiley, who is a member of the Sinixt Arrow Lakes band, along with Parkin, her husband, and Colville tribal members Michelle Wiley-Bunting and Trina Ray, and tribal descendant Danica Parkin, worked with 14 surviving fluent elders to establish a language immersion school that would help revitalize the Salish language. 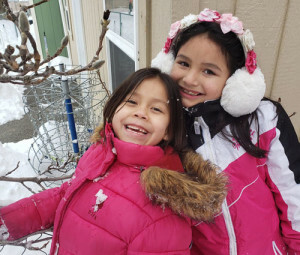 The Salish School of Spokane is a Native-led nonprofit organization that offers childcare and elementary school for families in the City of Spokane and surrounding areas. It is one of the few urban-based Indigenous language schools in the country. The school officially opened its doors in September 2010 with six students and one full-time employee. Over the past nine years, the school has grown substantially to 58 students and 30 full- and part-time employees. The school has produced 17 new fluent Salish language speakers and has been well-received by the community. In 2018, First Nations Development Institute (First Nations) awarded the Salish School of Spokane $90,000 through the Native Language Immersion Initiative (NLII) to build the capacity of Native-led organizations committed to preserving and perpetuating Indigenous languages. With the NLII grant, the Salish School of Spokane will expand its elementary school to a middle school by translating 7th and 8th grade math books into Salish, and training more language teachers. Salish is the language of instruction for all subjects (math, science, literacy, art, music, etc.) taught at the Salish School of Spokane. According to Parkin, a typical day at the Salish School of Spokane begins with students greeting the day in their circles. Throughout the day, students also learn to drum and sing in Salish, and learn about traditional foods and medicines. In addition to learning how to drum and sing in Salish, students also learn how to play the piano and sing contemporary songs in English. During the day, teachers read to students in Salish and English, but always expect their students to discuss and write their responses in Salish. The students at the Salish School of Spokane have benefited tremendously from this bilingual education. Parkin notes that 100 percent of the 3rd through 7th grade students are reading English at or above grade level, with many of those students actually reading at two or three grade levels ahead. With a 6:1 student-to-teacher ratio, students at the Salish School of Spokane are on par with students at private, upper-class schools. These accomplishments are even more impressive, Parkin notes, because 15 percent of the students at the Salish School of Spokane are or have been in the foster care system. The Salish School of Spokane offers free Salish language classes for parents and the community. In fact, parents with students at the Salish School of Spokane are required to complete at least 60 hours of Salish language classes per year in order for their children to attend the school. The goal is to encourage students to continue speaking the language once they leave the classroom when they are at home with their families. 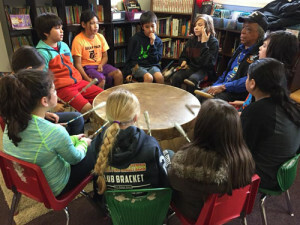 Parkin and the other founders of the Salish School of Spokane believe that inter-generational language interaction and transmission is the key to revitalizing the Salish language. With this goal in mind, they have expanded the free Salish language classes to a paid internship program that will teach parents to speak, read and write Salish. With the NLII grant, the Salish School of Spokane will provide language training to four interns hired from among low-income parents of current students. Interns will complete 200 hours of Salish language training, 160 hours of classroom training, and 30 hours of early childhood education training (i.e., first aid, background checks, tuberculosis tests, etc.). The internship program is intended to provide parents with a foundation course for a certificate in early childhood education. The hope is that these four parent interns will be able to use their newly acquired language skills to enhance their lives, both personally and professionally. As parents, they will learn to speak the language fluently so they can speak the language at home with their children. Professionally speaking, they will complete the internship program with the knowledge and skills needed to teach the language in a classroom setting. After completing the internship program, parent interns will be eligible to work at the Salish School of Spokane as early language instructors. 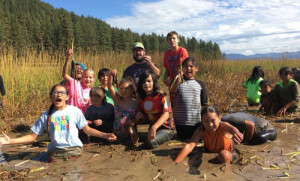 Salish immersion upper elementary class (grades 3-6) harvesting wapatos in Calispell Lake. Wapatos are an aquatic bulb and traditional food source. To learn more about this innovative language-culture community, please visit the Salish School of Spokane’s website. The website also includes all of the school’s language curriculum, which tribal elders mandated must be shared with other Native communities interested in language revitalization. This entry was posted in NL08 by rblauvelt. Bookmark the permalink.